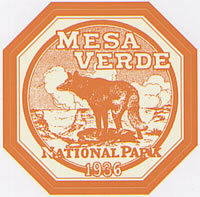 A cache of modern and historic postage stamps that feature the parks, cultures, flora and fauna of the American Southwest. 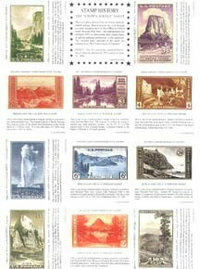 Each cache will have a different selection of stamps, but all will include the 4¢ 1934 Cliff Palace stamp. Housed in a display envelope. This is a replica edition of the set of ten commemorative stamps issued by the U.S. Post Office in 1934 to honor National Park Year. The reproductions are enlarged 160% to demonstrate their artistic beauty and the technical proficiency of the engravers. 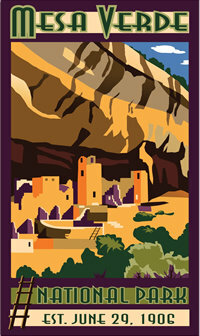 The national parks depicted in the series are referred to as "the Crown Jewels of America". 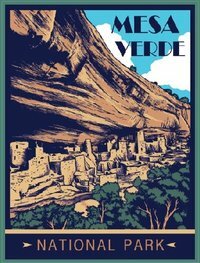 This colorful sticker features the towers of Cliff Palace and artwork commisioned for the 2006 Mesa Verde National Park Centennial. Made in the USA with fade-resistant UV ink on durable vinyl, suitable for indoor or outdoor use. Our custom retro-style artwork of the iconic Cliff Palace is now available on a sticker. Made in the USA with fade-resistant UV ink on durable vinyl, suitable for indoor or outdoor use. 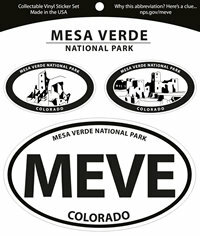 This set of three Euro style oval car decals features the four letter NPS designation for Mesa Verde National Park, and two smaller decals that feature Cliff Palace and Square Tower. The reverse features interesting information on how the NPS determines the park abreviations. Made in the USA with fade-resistant UV ink on durable vinyl, suitable for indoor or outdoor use. Dimensions (1) 5.5" x 3.25" and (2) 2.5" x 1.5"
The two stickers featured in this set are ideal for National Park Passport books and scrap-booking. 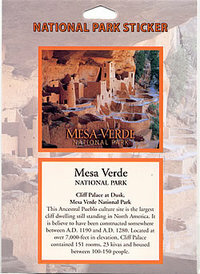 One sticker is a stunning photograph of Cliff Palace by photographer H. H. Huey, the other sticker is interprative text about Mesa Verde National Park. Not for outdoor use. Dimensions (2) 2.25" x 2.5"